We Hope you’re enjoying this day. It’s the one time of year everyone gets to be a little bit Irish. Today we are having a little get together with a friend, and of course there is Love Sack business to do. While I’m cooking and serving up the food, the guys will be designing and making the drawings for the front gable. We are also happy to say that we have another Warrior joining our team. He is a long time friend of ours with at least 40 years in construction. His name is Tonu. He has offered to come and help with the drawing, and to help with the construction of that Gable in June. Another Warrior, Barry who you haven’t seen in a while will be coming back to help with this job too. Every time I turn around, we get another offer from a friend to help. I truly don’t know what we would do without our friends. When we bought the cottage, she was going to be name the Lady Slipper, after my Orchid collection. Looking at her now… it would have never fit her. The Love Shack was given the correct name. Well, it’s back to the kitchen for me where I have been since early morning first baking the dessert. The Corn-beef and Cabbage is ready to start cooking and the Guinness is on ice. We are ready to become a little bit Irish. 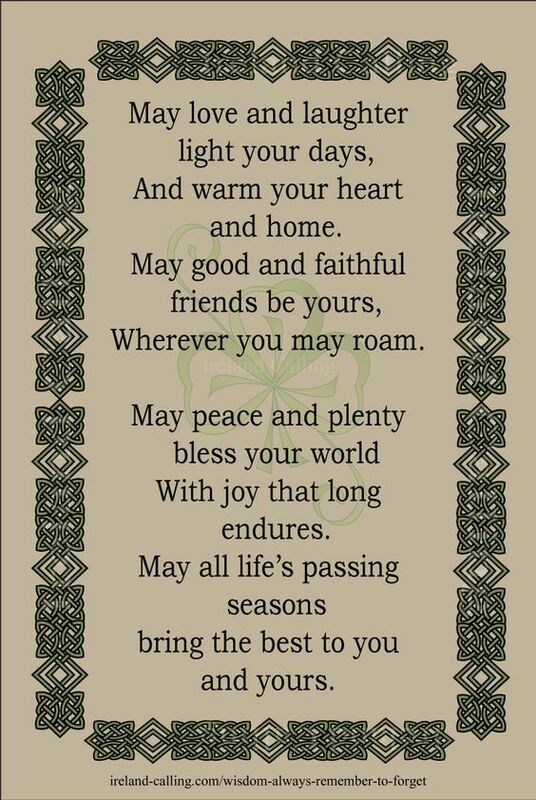 Here’s a Little Irish Blessing, I pick out just for you. Happy Saint Patrick’s Day from the Love Shack. The blessing is is wonderful, thank you!